It’s the birth date of Jerome Beatty Jr. (1918–2002), Matthew and Maria Looney series; Jean de Brunhoff (1899-1937), Babar series; Joel Chandler Harris (1848–1908), Uncle Remus stories; and John Milton (1608–1674), Paradise Lost. It’s also the birth date of Emmett Kelly Sr. aka Weary Willy (1898–1979) a famous tramp clown known for trying to sweep a pool of light. It’s Weary Willy Day, in honor of this sad-clown performer. Read Clown by Quentin Blake, Clown of God by Tomie dePaolo, and My Friend is Sad by Mo Willems. It’s Anna’s Day, celebrating people named Anna in Sweden and Finland, and also marks the day to start preparing lutefisk for Christmas Eve. Every now and then on the Almanac, I like to discuss a book about children’s books, written for adults. 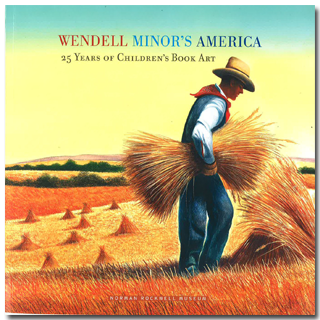 Today, for Read a New Book Month, the Almanac features Wendell Minor’s America: 25 Years of Children’s Book Art, published by the Norman Rockwell Museum in conjunction with their current Wendell Minor exhibit. In this gorgeous and lavish book, Wendell’s art is displayed along with several essays that discuss his accomplishments over the last 25 years. David McCullough, Leonard Marcus, Jean Craighead George, and Connie Rockman are among those who present very thoughtful pieces about Wendell and picture books in general. But the best piece of writing in this book actually comes from Wendell himself. It begins with his report to his parents from the Aurora (Illinois) Public Schools, detailing his struggles with reading. Wendell describes himself as a “recovering dyslexic.” Growing up in the heartland, struggling with school, he turned to art as his salvation. 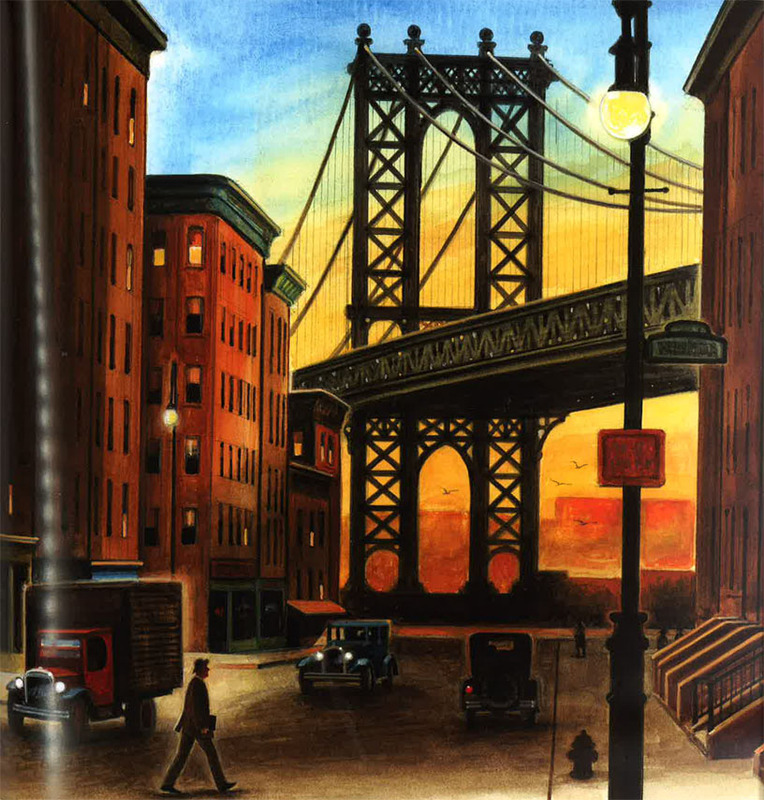 After he set out to New York City, he found work in the Paul Bacon studio and began designing iconic book jackets. Some of these—including To Kill a Mockingbird and the canon of David McCullough—are included in the book. A turning point in Minor’s career came in 1988, when he was asked to create the internal art for Diane Siebert’s Mojave. His love of research, especially in the fields of history and natural history, embellished his work and made it stand out. Minor later went on to collaborate with many writers, including Jean Craighead George and Buzz Aldrin. The catalog exhibits the amazing scope of Wendell’s work with glorious images from these books. With so many teachers today hunting for narrative nonfiction for the classroom to fulfill the Common Core standards, Wendell Minor’s America suggests a welcome approach. It makes an ideal springboard for an artist study that brings in books from all areas of the curriculum. Minor’s full-color paintings have been rendered with great dexterity and stunningly pay tribute to many American heroes. Right now the book can be ordered only from the Norman Rockwell Museum where the exhibit will run through May 26, 2014. Its opening in November featured lectures by Wendell and by David McCullough as a packed, standing-room-only crowd viewed the galleries. If you don’t have a chance to see the exhibit yourself, pick up a copy of Wendell Minor’s America for yourself or that children’s book lover on your gift list. I myself have already exhausted several copies and need to go back for more. Wendell Minor’s America reminds me why I am so happy to be part of the children’s book community. People with Wendell’s talent, dedication, hard work, and determination have made this group of books their life’s work, and children and adults are much richer for their devotion. Thank you, Wendell, for these glorious twenty-five years. Originally posted December 9, 2013. Updated for . This looks stunning – thanks for the tip off! This sometimes homesick expat really appreciates the American themes. The images here have me longing to see this work. The city image you’ve posted is just glorious. It makes me want to create like that. Gordon: Wendell’s work always makes me wish I could create images rather than use words. Anita, thanks for the re-post : “Wendell Minor’s America” exhibition will travel to Aurora University in Illinois. Opening date is October 3, 2015. More venues will be announced next year.